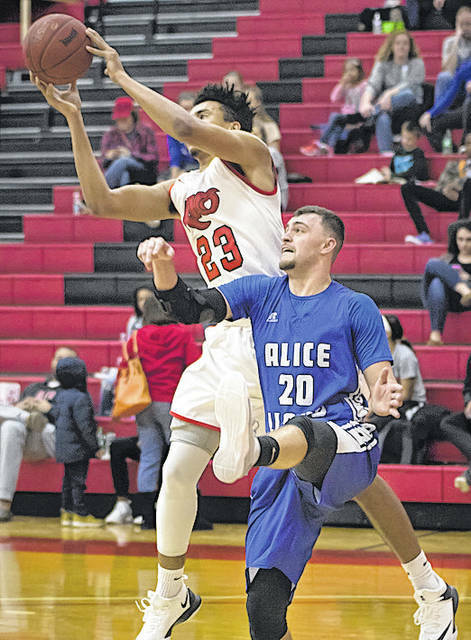 Rio Grande’s Greg Wallace outjumps Alice Lloyd’s Chance Cornett for one of his career-high 12 rebounds in Sunday afternoon’s 104-85 win over the Eagles at the Newt Oliver Arena. Wallace also had a career-high 16 points in the victory. RIO GRANDE, Ohio — The University of Rio Grande men’s basketball team parlayed a quick start and an all-around team effort to snap a three-game losing streak on Thursday night. The RedStorm used the same formula to record a second straight win on Sunday afternoon. Head coach Ken French’s squad bolted to a 13-point lead inside the game’s first eight minutes and went on to post a 104-85 win over Alice Lloyd College in River States Conference action at the Newt Oliver Arena. Rio Grande, which equaled its single-game high for points this season, improved to 9-12 overall and 4-5 in conference play with the victory. Alice Lloyd dropped to 10-8 overall and 3-6 in the RSC with the loss. The Eagles, who entered the game as the highest scoring team in NAIA Division II, were held to their fourth-lowest scoring total of the season. ALC got consecutive buckets from Chance Cornett after Rio Grande had scored the game’s first five points, but the RedStorm responded with a 16-4 run to open up a 21-8 lead following a jumper in the lane by junior Abe Eze (Lagos, Nigeria) with 12:04 left in the first half. The Eagles got no closer than eight points throughout the remainder of the half, while Rio built a 19-point cushion before settling on a 17-point advantage, 56-39, at the intermission. Another bucket by Cornett got ALC as close as 12 points, 58-46, with 16:29 to play in the game, but the RedStorm countered with a 10-0 run over the next two minutes to build a 22-point advantage and were never seriously threatened the rest of the way. Rio twice led by as many as 23 points down the stretch and the Eagles got no closer than 13 points. Sophomore Stanley Christian (Norfolk, VA) led seven different double-digit scorers for Rio with 19 points. He narrowly missed a double-double effort by also pulling down nine rebounds. Senior guard Will Hill (Worthington, OH) added 18 points in the winning effort, while sophomore Greg Wallace (Montego Bay, Jamaica) had career-highs of 16 points and 12 rebounds. Eze also finished with 16 points and a pair of blocked shots, while senior DeVon Price (Pickerington, OH) had 12 points, four assists and four steals and the freshman duo of Trey Kelley (Minford, OH) and Jaxon Burgess (Louisville, KY) had 11 and 10 points, respectively. Alice Lloyd had five double-digit scorers of its own, with Blake Davis’ game-high 25 points leading the way. He also had a game-high four steals. Timmy Dalton had 17 points and a team-best seven rebounds in the loss, while Cornett tossed in 13 points and the duo of Dondre Warren and Noah Young tallied 10 points each. Austin Crisp also had seven rebounds for the Eagles. The two teams were whistled for 56 combined fouls (28 each) and five technical fouls – three on ALC and two on the RedStorm. There were also 69 combined free throw attempts in the contest — 36 by the Eagles and 33 by Rio. The RedStorm shot 60.6 percent in the first half (20-for-33) and 58 percent for the game (35-for-60), while also out rebounding their guests, 43-36. Alice Lloyd, which entered the game averaging just over eight three-pointers per game and shooting just over 38 percent from beyond the arc, was 4-for-23 from distance (17.4 percent). Rio Grande returns to action on Tuesday night when it travels to Asbury University for a 7:30 p.m. tipoff.